I purchased the 9mm and 45acp Mini bullet feeders and upgraded them to my needs. I drilled out the tubes added 4' poly tubes from my old home made bullet feeder and a center support. I now have a 500 round Maxi bullet feeder. You guys make some great products. Absolutely the most practical, easy to setup and use feeder I have found. What a pleasure. Can't say enough about this product. It would sure be nice if you guys could come up with a primer feeder that works as well. Wouldn't that be nice? The Mr. Bullet feeder works great on my Hornady L&L. Very easy setup. The only issue is you that really either need two and someone else to load one once it gets empty to really speed up the loading process. With just one, the time spent loading it negates the time saved WHILE loading! If I had a choice of either my 3-D printed case feeder or the bullet feeder, I would take the case feeder every time! I need to order a couple more bullet magazines I guess. Tube is easy to fill and works great, it’s amazing how quickly you go through the entire tube. I received two of the mini bullet feeders (45acp and 40S&W) for Christmas. One of the tube assemblies would not slide onto the feeder die. I contacted customer service and was told to take fine grit emery cloth and sand it down until it fit. They did say that if I broke anything, they would replace it. It took a couple hours, but I finally got it to mostly fit (not as good as the 2nd feeder tube did). Then, the bullets in some of the tubes wouldn’t drop. I took it apart again and found that the adhesive used to secure the tubes to the housing had squeezed out into the tube. I used a knife to remove the excess adhesive and now it works fairly well. The bullets still hang up occasionally and you need to twist the assembly a little to get the tube lined up with the die. The holes in the advance mechanism should have been tapered a little to eliminate this issue. I think quality control on these assemblies is extremely poor. All you would have to do is see if the assembly fit on the bullet drop die and drop a bullet down each tube. I really like the mini bullet feeder. With a few tweeks and some quality control it would be awsome! Great product and I love the way it helps with the loading operation. Quick change over to other bullet caliber. Een heel goede product als je hem goed afgeregeld heb gaat het daarna vlekkeloos door. Min første bullit feder gør mit arbejde maget nemmere at udføre. The Mini Mr.Bulletfeeder by DAA uses a 6-tube magazine system which holds roughly 100 bullets. It feeds into the same brilliantly reliable dropper die assembly as used on the Mr.Bulletfeeder. Using a Bulletfeeder while reloading is a real pleasure. It makes the reloading process faster and much easier. If you have never used one, you are missing out on one of the greatest reloading assists out there! A Bulletfeeder also improves safety, by preventing the need to insert your fingers under the tool head to place your bullets on the brass. Everyone should use one! 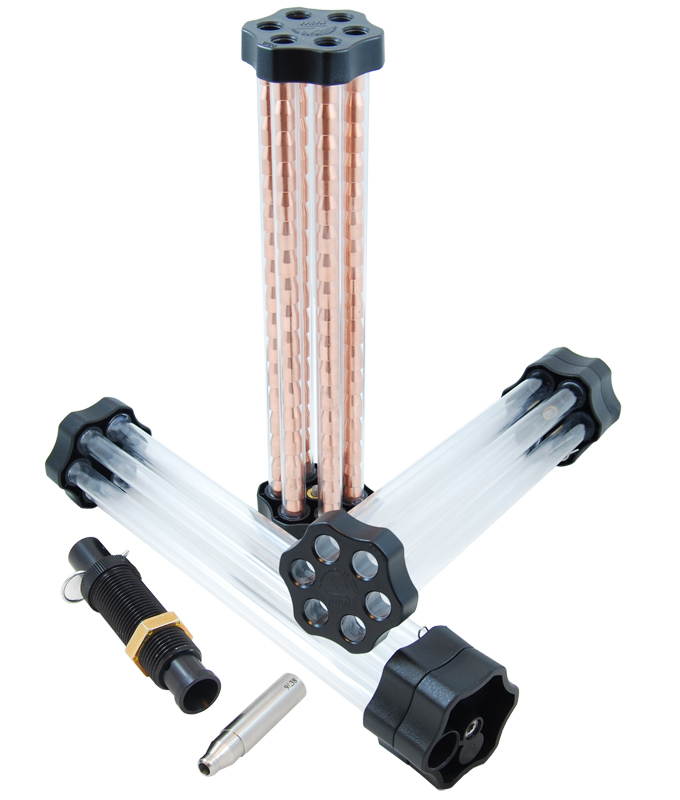 You need to buy a press, other reloading accessories, not to mention ammo components. For many, by the time all that is purchased, they have stretched their budget about as far as it will go. And the Bulletfeeder gets passed on, for lack of funds. This was our motivation when setting out to develop a less expensive version of the Mr.Bulletfeeder, and it lead to the new Mini Mr.Bulletfeeder. Each magazine of bullet tubes needs to be filled by hand before reloading, much in the same way you would fill your primer tubes before starting your reloading session. With a little practice, it will take you about 2 minutes to fill the tube assembly. And this can be done in advance while watching TV in the comfort of your living room. Additional tube assemblies can be purchases separately (or as a bundle), thus allowing you to pre-load 300, 400 or more bullets before starting your reloading session. 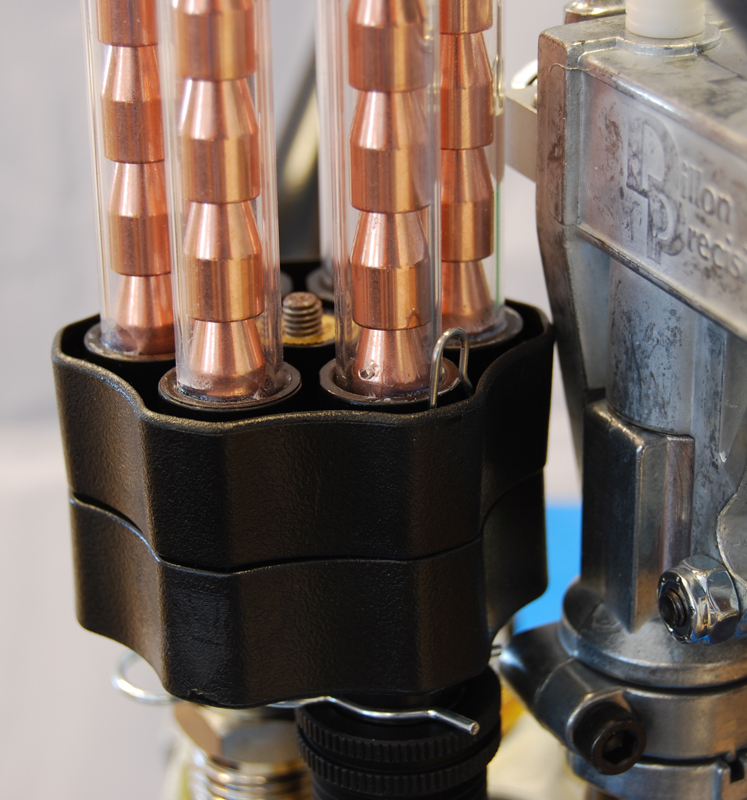 While reloading, you will see the bullets drop down in the transparent tube, as they feed into the dropper-die assembly. Once a tube is empty, you simply rotate and click the next tube into place and keep reloading. Transition to the next tube takes just a second or two. Once the entire 6-tube magazine is empty, either reload it by hand, or drop your 2nd assembly into place to continue without delay. 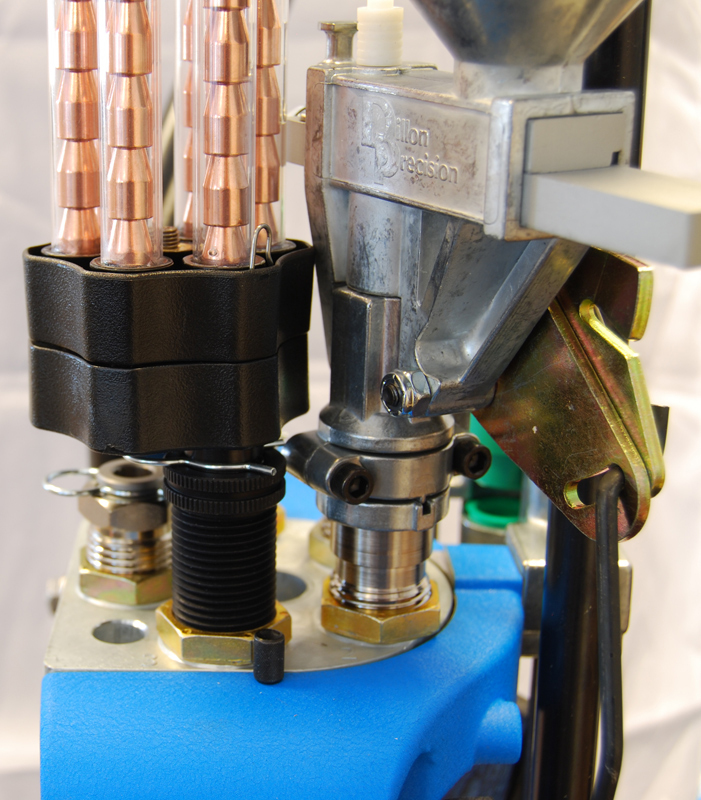 The Mini Mr.Bulletfeeder can be used on any progressive reloading machine which uses the same size dies as Dillon, however please note that the powder funnel we supply with the Mini Mr.Bulletfeeder is designed to be used only in the Dillon powder drop! If you wish to use the Mini Mr.Bulletfeeder with another press, you may need to get another powder funnel to expand the brass. Be aware that the bullet feeder does require a station in your tool head, directly after the powder dropper. We have found it is difficult to use the Mini Mr.Bulletfeeder on a 1050 when a powder check is being used in the following station. This has to do with the angle in which the powder dropper sits, forcing the bullet dropper to rotate further away, over the next station. This is an issue only on a 1050.
the expanding powder funnel supplied is for the Dillon reloading machines only. Not compatible with other brands. 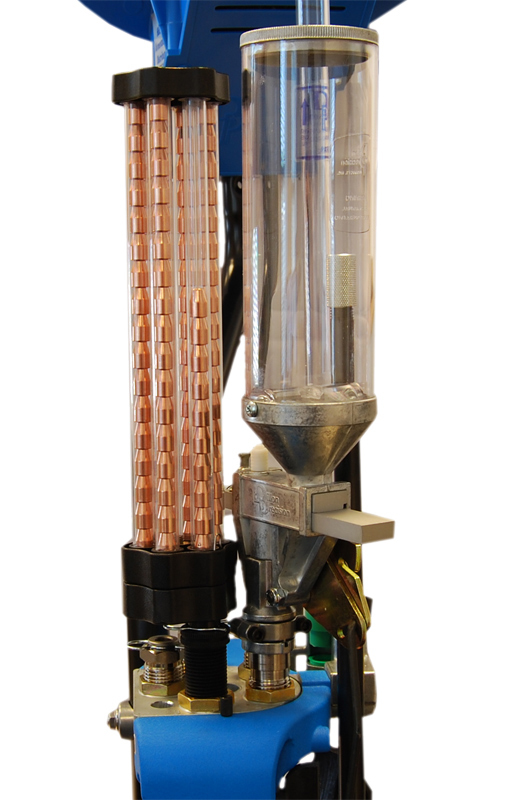 To use with the LnL press, you will need to purchase their expanding powder funnel separately.